Gianluca Pellerito is currently the only Italian band leader scheduled in 2016 at the legendary Blue Note in New York. Gianluca Pellerito, the 22 year-old Italian drummer, lives and studies in Boston at the prestigious Berklee College of Music. He and his quintet will play on March 21 at 8pm, on one of the most famous stages in the world: the Blue Note in New York. In 2009, Gianluca was the world youngest musician to play as band leader at the Blue Note when he was only 14 when he made his debut at Blue Note in Milano. The first in 2009 is titled "Three Drums Show" with Peter Erskine – Alex Acuña and an orchestra – Etichetta The Brass Group Records – a live recording at the Verdura Theatre in Palermo on July 29, 2009. The second album, "Jazz my Way" Herbie Hancock Tribute, was released in 2013. It was recorded by a quintet at the Umbria Jazz Winter on December 28, 2012 and the concert preview was performed on July 5, 2013, during the opening evening of the Umbria Jazz Summer 2013, for the Emercy Universal label. He was born in Palermo, Sicily on May 1,1994, His first concert at age 8 took place at the Umbria Jazz 2002 with the Berklee band. His first concert as band leader came when he was 13 with "Gianluca Pellerito and Orchestra" at the Golden Theatre in Palermo when Gianluca was added to the noted repertoire of the Jazz della Fondazione Brass Group. He and an orchestra with 30 musicians attended the event together with well-known artists including John Pizzarelli, Rachelle Ferrell, Billy Childs and others. 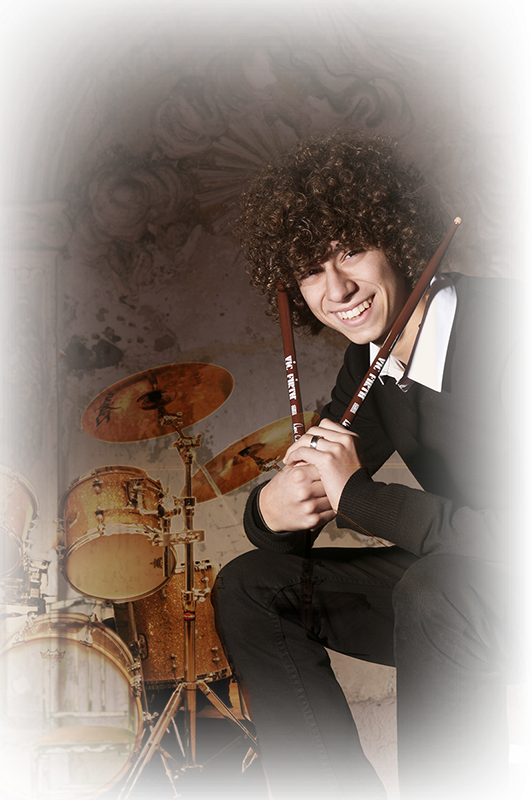 Gianluca met Peter Erskine when he was 14 and Erskine invited the young drummer to open his concert. Once back in America, Peter Erskine in an interview with the magazine Rhythm, said, "Gianluca Pellerito reminds me so much of when I was young and I believe he will be my future"
A great friendship follows and two years later it gives life to the live concert and album "Three Drums Show" with three drums on the stage: Erskine's, Gianluca's and Alex Acuña's along with the great orchestra of the Fondazione The Brass Group. At 16 Gianluca was invited by the Kennedy family to play at the Kennedy Center in Washington. Two tours in the United States will follow, with stops in New York and Washington. In 2011 he was the special guest at a concert of the Incognito. Band leader Bluey Maunick called Gianluca again when the band played at the Blue Note. In 2012 the concert for the London Olympic Games was organized and Gianluca and his quintet attended. In October 2012 Gianluca Pellerito was appointed ambassador of Italian jazz in England. In December 2012 he recorded his second live at UMBRIA JAZZ WINTER – Orvieto. In 2013 he opened the 60th edition of UMBRIA JAZZ SUMMER – Perugia. In 2014 he toured the United States and held concerts at the Highline Ballroom in New York and at the Blues Alley in Washington. He has already toured Brazil twice where he attended the TUDO JAZZ FESTIVAL. Gianluca has lived and studied in Boston at the noted Berklee College of Music since 2015. I have a special bond with the Blue Note – Gianluca Pellerito stated– the Blue Note is a magical venue. I debuted at the Blue Note in Milano when I was 14 and today being in its historical venue in New York is like a dream come true for me. Peter Erskine, the person who discovered him, said: "The very first time I heard Gianluca Pellerito playing was with the Orchestra Jazz Siciliana for the Kenton project. It immediately reminded me when I was younger. He is a greatly talented young man. Being on the stage with him was and will still be an honor for me". Alex Acuña said: "I believe that Gianluca is a great musician and I think I can learn a lot from him. I am looking forward to sharing the stage with him, and with Peter, of course". Peter Erskine, Alex Acuna, Incognito, Bluey Maunick, Fiorello, Emil Richards, Jim Mullen, Matthew Cooper, Kevin Robinson, Julian Crampton, Jamie Anderson, Alistair White, Mo Brandis, Imaani Saleem, Intra, Franco Cerri, Vanessa Haynes, Giorgio Rosciglione, Fabrizio Bosso, Francesco Cafiso, High Five Quintet, Michael Rosen, Jason Rebello, Karl Rasheed Abel, Paul Stacey, Alfredo Paixao, Francesco Poeti, Gigi Cifarelli, Nick the Nightfly, Dirotta Su Cuba, Simona Bencini,Jazz Siciliana, Berklee College Group, Francesco Puglisi, Sade Mangiaracina, Luca Meneghello, Rossano Gentili, Faso, Christian Meyer, Luca Mannutza, Lorenzo Tucci, Pietro Ciancaglini, Giuseppe Milici, Gianni Cavallaro, Daniele Comoglio, Sandro De Bellis, Daniele Coro, Davide Ghidoni, Andrea Pollione, e tantissimi altri.